Whether your pounding headache is from tension or because it’s that time of the month, you can eat certain foods to help alleviate it. Here’s a list of headache-fighting foods. Dehydration is a common cause of headaches. 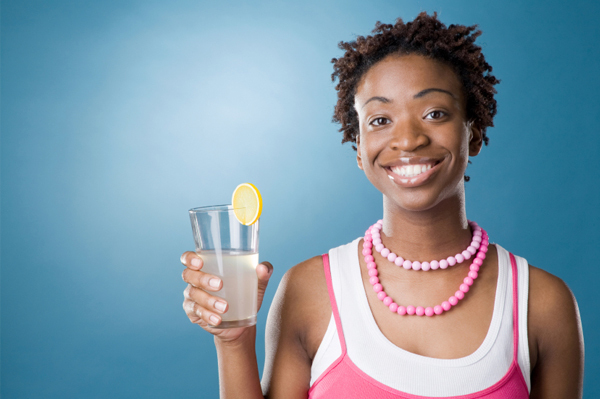 Aim for eight (8-ounce) glasses of water every day. Add a slice of lemon or lime to keep your tastebuds entertained. Try an electrolyte sports drink if you tend to get headaches after long periods of exercise. In addition to being a quality source of fiber, whole grains are rich in magnesium, a mineral that can soothe headaches due to menstruation. Eat a whole-grain food at every snack and meal. Other magnesium-rich foods include seafood, nuts, seeds, avocadoes, raisins and leafy greens. This flavorful, fatty fish, along with tuna and mackerel, is swimming with omega-3s, healthy fats that have anti-inflammatory properties that can inhibit inflammation in the brain. Add chopped salmon to your morning omelet or dig into it over a bed of greens for lunch and dinner. Flaxseed and flaxseed oil are also high in omega-3s. High in the power antioxidant vitamin E, olive oil can help improve circulation, reduce inflammation and balance out hormone levels. Other sources of vitamin E include plant oils (such as wheat germ and canola), nuts and nut butters, seeds and seed butters. Ginger isn’t just for nausea. This fiery little root is also beneficial in fighting headaches because of its anti-inflammatory and antihistamine properties. Make a ginger root tea or nibble candied ginger when you feel a headache coming on. Sensitivity to certain foods can trigger head pain from mild headaches to full-blown migraines. Common headache foods include aged cheeses, food additives (MSG, artificial sweeteners, nitrites, food colorings), processed foods, chocolate, alcohol and caffeine. If you suffer frequent headaches, keep a headache diary that lists your foods, moods, activities and headache frequency to find patterns and triggers that cause head pain. Click here for foods & recipes to fight headaches! The opinions expressed in this article are of the author and the author alone. They do not reflect the opinions of SheKnows, LLC or any of its affiliates and they have not been reviewed by an expert in a related field or any member of the SheKnows editorial staff for accuracy, balance or objectivity. Content and other information presented on the Site are not a substitute for professional advice, counseling, diagnosis or treatment. Never delay or disregard seeking professional medical or mental health advice from your physician or other qualified health provider because of something you have read on SheKnows. SheKnows does not endorse any specific product, service or treatment.